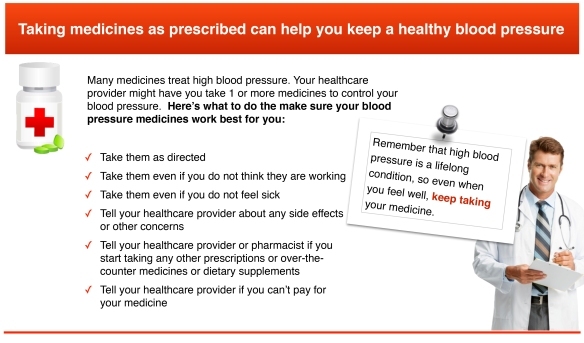 Taking your medicines as prescribed is important for a healthy blood pressure and keeping you healthy. 3. Get a pill box. 4. Download a medication reminder app to your smartphone. Tell family and friends about your medicine schedule so they can help remind you. 6. Set a daily routine. Combine your medicines with something you do at regular times like brushing your teeth or eating breakfast or dinner. Taking your medicines at the right time can become a good habit. 7. Take it with you. Remember to take your medicines with you when you are away from home. Bring enough of your medicine with you when you go on trips. Always put them in your carry-on luggage. 8. Refill your prescriptions on time.